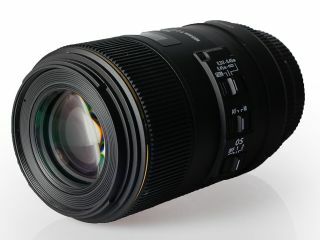 All down to "economies of scale"
Sigma has announced that it has reduced the suggested retail price of its popular 105mm macro lens which was launched in August 2011. The Sigma 105mm f/2.8 EX DG OS HSM lens has now been reduced to £649.99, whereas the previous suggested retail price was £799.99. Speaking to TechRadar about the reason behind the price drop, Paul Reynolds from Sigma Imaging UK, said that it was all down to economies of scale, and the popularity of the lens since launch. "Reading between the lines, I am assuming that it has been more popular than had been anticipated, meaning that the price can now be reduced as more are being made," he said. The lens boasts Sigma's optical stabilisation along with high speed autofocus, internal focusing, SLD glass and a 1:1 macro reproduction ratio. Its optical construction has 16 elements arranged over 11 groups, which is reflected in its relatively large size and weight. In our in-depth review of the lens, it received four stars and impressed us with its sharpness throughout its aperture range, especially at its widest aperture of f/2.8.